A touch of Mediterranean and luxury in magical Hobart with beautiful views to the Derwent River and mountains beyond. The world renowned MONA Art Museum is only 2 minutes away or you can walk there (1.8km) from the house via the nearby reserve. Isle of Views is a beautifully decorated, modern and spacious 3 bedroom 2 bathroom home. A clever home design taking advantage of the gorgeous views through the ample windows which fill the rooms with light. The layout is perfect for friends or families traveling together as rooms offer plenty of space and privacy. Isle of Views sits at the end of the cul-de-sac in a beautiful safe and quiet neighbourhood. There are two large and private bedrooms upstairs, neither have adjoining walls. Bedroom 1 has 2 single beds and views, Bedroom 2 has a KING bed and a wall mounted 40 inch SMART TV. All bedrooms include large robes and mattresses are top of the range. Soft mattress toppers are included for extra comfort and electric blankets are provided to keep you warm throughout winter. Linen is supplied and professionally laundered. The large main bathroom has a toilet, bath, shower, under floor heating and heat lamps above to keep you warm. Towels are provided for guests as well as a hairdryer and basic toiletries. The open and modern kitchen faces the dining and living areas. It has a full size fridge, coffee machine, dishwasher, microwave, toaster, kettle, cook-top and wall oven. The pantry and fridge are stocked with generous breakfast supplies and essentials. The dining area comfortably seats 6 and has beautiful views of the river, MONA and to the mountains beyond! The large open living area has Italian leather furniture and quality fittings throughout. Enjoy watching movies in 3D via the 55 inch SMART TV. There is a selection of 3D movies and standard dvds to choose from. There is also a Blue Ray DVD and Sound Bar plus FREE unlimited fast Wi-Fi. An efficient reverse-cycle air conditioner keeps the living area warm or cool for your comfort. The room opens to the expansive private balcony, perfect for al fresco dining. Enjoy the outdoor BBQ and views! Downstairs can be privately closed off from the rest of the house via the sliding door at the bottom of the stairs. The Queen bedroom is lovely with a private garden view. The mattress is top quality and includes a soft mattress topper for extra comfort. Linen and electric blanket is supplied. The adjoining bathroom has a toilet, shower and heat lamps on the ceiling to keep you warm. Towels, basic toiletries and hairdryer are provided. Beside the bathroom is the games room. Here you will find a tv, wii console, games, bean bags, a desk and chair plus the European laundry, hidden in the cupboard. The laundry includes washing machine, dryer and ironing facilities. In addition, there is a large room with a table tennis table, board games, toys and a selection of books and magazines to choose from. Parking for two cars in driveway. BBQ and outdoor table on balcony. Lovely views to River, Cadbury's and MONA. Private fenced back garden with gates and under-cover sitting area. From bike trails to wine trails and everything in between, this home has all you need to enjoy the best that Hobart has to offer. Isle of Views offers a fantastic location to base yourself for day trips within Hobart and beyond. Hobart's biggest tourist attraction, the world renowned MONA Art Museum is just 2 minutes drive away or you can walk there (1.8km) from the house via the nearby reserve. You can spend the whole day enjoying the gallery and the fantastic architecture of the building. Restaurants and cafes offer meals in an ambiance surrounded by gorgeous views. For $20 a day you can hire a bike from MONA and ride the Inter City Cycle way to Hobart's waterfront or Salamanca. Local shops are 2km from the house and a major shopping centre is less than 5 minutes away. It is 7 minutes drive to the Derwent Entertainment Centre, and lovely parks such as Montrose Bay with beautiful walking tracks are nearby. 17 minutes drive to the vibrant North Hobart restaurant strip. 28 minutes by car to Salamanca Market and Hobart waterfront. Mt Wellington is worth a drive to the top. The views are stunning. Bonorong Wildlife Sanctuary is 19 minutes. It's a beautiful park for rescued native wildlife. Meet the Tasmanian devils, wombats, pat the koalas and the very friendly kangaroos. Historic Richmond is 27 minutes by car. World Heritage Mt Field National Park 1 hour 18 mins (Russell Falls 58mins) The drive there is beautiful and the giant trees and waterfalls are impressive! Port Arthur is 80 minutes away. If you like history, this is a great place to visit. There is so much more to see in Tasmania. We provide a booklet with plenty of information to help you plan your stay. The home offers luxurious comfort and has great ambiance. There are three separate outdoor areas to enjoy the fresh air. The wonderful views and peaceful garden are very relaxing. Great neighbourhood and a quiet safe location. There are plenty of playgrounds and parks nearby. Walk to MONA via the reserve just 100 metres from the house. Montrose Bay has a beautiful walking path along the river as well as BBQ's and playground for the children. Opposite MONA, the bistro restaurant offers good value family meals or the Boatshed restaurant on Cornelian Bay offers great food and service, amazing water views and playground for the kids. We look forward to welcoming you to Isle of Views and are sure that you will feel at home. Our aim is to ensure your stay at Isle of Views forms part of your wonderful and unforgettable memories of your Hobart holiday. Strictly a non-smoking house. We provide an ashtray outside. We respect our neighbours and request that you do follow a strictly "NO PARTY" rule. This home has internal stairs, a balcony and glass furniture so it does not suit toddlers and young children. 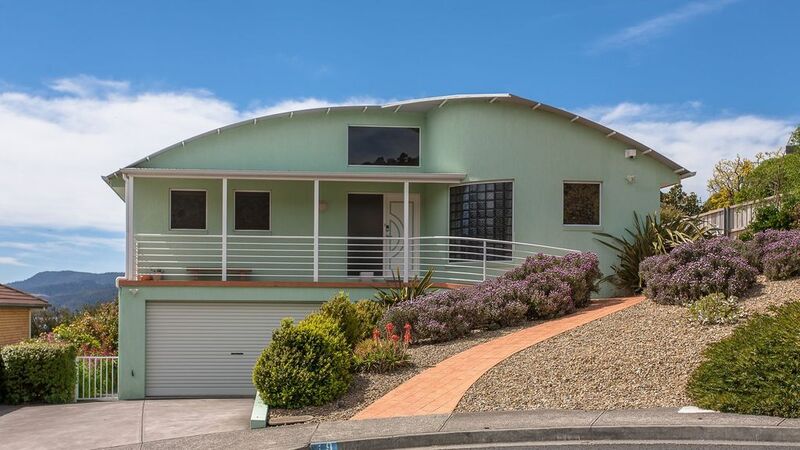 this is a great house which is close to Mona and easy access to the city and surrounds. good coffee and instructions for use. We have really enjoyed our stay here. thanks for the bead etc. Well equipped and comfortable house. Good location for exploring Hobart and environs. The house delivers what is promised and we greatly enjoyed our stay. It was clean and well maintained. We appreciated the additional touches like a supply of coffee and tea and some milk, bread and eggs plus other items. The information provided by the owner on area attractions was particularly helpful. Would stay here again without hesitation. Spotless house all ready to move in. Lovely little neighbourhood with park close by for children and a view of Mona while sitting on the deck. Wii and a table tennis table for those inclined. Lovely views, relaxed atmosphere, fantastic family friendly layout and activities. Close to all amenities, quite and peaceful location. This home was modern, clean and tidy, with everything you could need or want included. Will certainly return and recommend. Credit to the owners. It was a pleasure to stay in this homely property. Fantastic house. Very comfortable, with great views.